On Saturday, October 24th, millions of volunteers across the U.S. united with a common mission: to improve the lives of others as part of Make a Difference Day, an initiative spearheaded by USA TODAY. It’s refreshing that a nationwide event’s sole purpose is to simply remind us to reflect on how each and every one of us makes a difference in our daily lives – even if it’s as simple as throwing a water bottle in the recycle bin instead of the trash. Working in healthcare PR, I definitely didn’t anticipate how much I could make a difference prior to coming to Tonic Life Communications. While the quantity of work was certainly expected, it’s the quality of the work that has continued to exceed my expectations and made me realize why we do what we do. Bringing people together. Our team worked tirelessly throughout the summer to pull off a first for our client’s unbranded educational campaign: host an in-person event where RA patients, caregivers, rheumatologists and even a celebrity who lives with RA can come together to openly discuss the big, fat elephant in the room – communication gaps between patients and their doctors, or as we (in the biz) like the call it, “shared decision-making.” All attendees came to the table with honesty and sincerity, not to mention the feedback on the event’s positive impact was absolutely priceless; one attendee even cried while sharing her journey living with a chronic illness and expressing thanks for an event that helped serve as a support group. Working on this event completely opened my eyes and taught me the importance and value of live, local, in-person events to connect directly with the patients our clients’ treatments help. Spreading the word. Research and development is a major focus at any innovative pharmaceutical company. 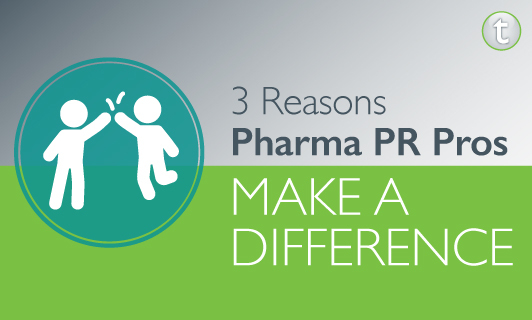 As new therapies and scientific data continue to become available, it’s critical to make sure the word is spread – and that’s where we PR folks come into play. We help raise awareness of important initiatives through internal communications, press releases, media interviews, patient advocacy campaigns, and more. It’s nice to work toward the ultimate goal of getting helpful information in the hands of those whose lives may better from it. Looking ahead. It’s the most wonderful time of the year! No, not the holidays. I’m talking about business planning. Businesses across industries are busy planning for the next year, and as their trusted communications consultants and strategists, we join meetings and brainstorms discussing how to better the company and its customers for the year ahead. We healthcare PR professionals are tasked to research, present and execute innovative – yet realistic – ideas for our clients to help contribute and drive the business forward to success. This takes a lot of “looking at the big picture” and seeing what is not only best for the company, but more importantly what is best for their customers. While working in healthcare PR certainly has it challenges, I find it to be extremely rewarding. With every event planned, press release written, and business plan developed, we are making a difference.